Why, what, and how to e-sign a document online. 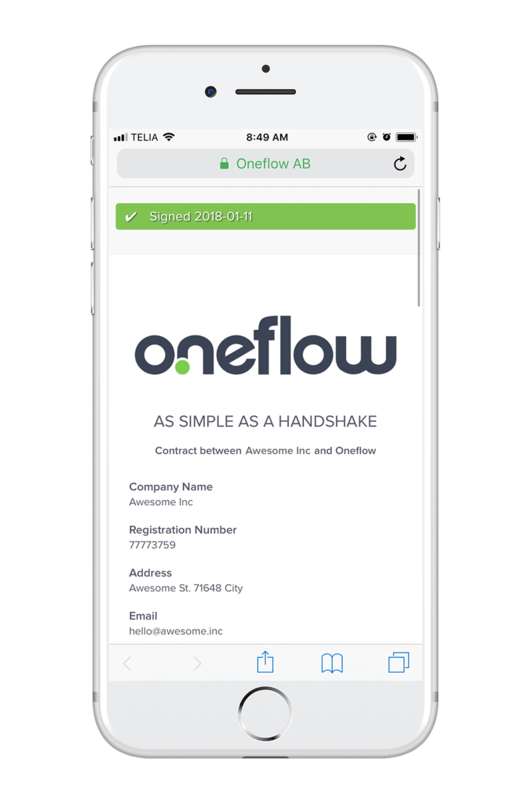 At Oneflow, we believe that e-signing will be the default way of signing documents. It is only a matter of time before e-signing becomes a defacto in the contract process. Signing documents the traditional way, i.e. print, sign, scan, is not only slow, it creates unnecessary usage of paper. According to a recent survey, 70% of the total waste in offices is made up of paper and as much as 30% of print jobs are never even picked up from the printer. Even worse, 45% of printed paper ends up in the trash by the end of the day. That is a lot of waste of resources. Moreover, in today’s competitive landscape, speed and automation are critical factors in determining the success and survival of any organizations. In another research, it is found that organizations who deploy speed and automation as their strategies are 60% more profitable and five times faster in decision-making than organizations who do not. In other words, e-signing should be part of your growth strategy. E-signing is leaving electronic fingerprints. E-signing documents are legally binding in most countries around the world. Besides making the process paperless, e-signing makes it easy for anyone to sign a document from any device. It is also, in fact, more secure than signing a document with ink on paper. Ask your e-signing vendor about multi-factor authentication to increase security, such as SMS and electronic identification (such as Bank ID in Sweden). Oneflow’s e-signature is sealed against tampering. It saves layers of information about who signed what, when, where and how, creating a data trail that details what the e-signature really signifies. E-signing with the highest level of trust. Our e-signature is both qualified and verifiable. This means that it is tamper proof and vendor independent, i.e. you’ll never have to go through Oneflow if you would like to verify the e-signature. Contracts are sealed and we guarantee that no changes can be made in the signed documents without leaving a digital footprint. All contracts signed through Oneflow includes trusted certificates that are a member of the Adobe Approved Trust List. Get real-time updates on the entire e-signing process after the contract is sent. Has the contract been opened, modified or signed? Add multi-factor authentication for additional security on the user ID authentication process by using SMS and electronic identification, such as BankID. Set automated pre-sign approval workflow so there is no need to manually email or remind approvers whenever there is a change to the contract. Offer an amazing e-signing experience. Signer gets an invitation to access and sign your contract in Oneflow through a unique URL that is impossible to replicate or guess, without having to create an account. Your contract is fully responsive and accessible from any web browser and device with just a click. The signed contract can be downloaded as a PDF by all parties involved. How to sign a document online. You will receive an email from Oneflow with a Sign up link where you can complete the registration of your account. Use the default template to create your first e-contract. You are now ready to create your first contract. You can use the Default Template to start with. Fill in the content of your contract like you would do in Word or Google Docs. You can change the size of the font, font type, insert image, attach file to the contract, and more. You can also change the content layout by clicking on the Edit Layout button at the bottom of the contract view. Add a counterparty and click send! Once you’re happy with the contract you’ve just created, remember to save by clicking on Save Changes button. You will be asked to fill in company registration number and a valid email before you are able to Send Contract. You can customize the email message accompanying the contract in the popup window once you click on Send Contract. Your counterparty will receive an email with a secure link to e-signing your contract. E-signing video: How to e-sign a document online in 3 easy steps. Find out how to make an electronic signature and sign a document online for free in this step-by-step video. Let us know! We’d love to show you in a demo. What e-signing methods does Oneflow offer? This is the default setting for Oneflow verification and e-signing. Your counterpart receives an email with a secure and unique link to the contract, and can sign from the application by using the green “Sign” button. Your counterpart will receive an SMS with a 6-digit code and then use it for confirming their identity when they sign your contract. Of course, this requires that you provide a recipient phone number and that you have SMS enabled on your Oneflow account. Read more about enabling SMS here. Please note that this signing method is only available for users with Swedish bank accounts. This will allow you and your counterpart to sign a Oneflow contract using BankID. Signing with BankID requires that you have a BankID application installed on the device you’re using. For more information on BankID, please contact your bank. Your counterpart can sign a contract with their private Bank ID, but your company will need to order a certificate from us. The process will take 1-2 business days, and we will contact you when your BankID is ready to use. To order a certificate, go to Preferences, click on BankID in the left sidebar menu and select “Activate”. Provide us with a Display name, perhaps the name of your company or product, and click “request BankID” to send your application to us. Oneflow does offer manual signing, and you may still use the benefits of the Oneflow archive and contract life cycles. But it’s important to remember that no legally binding e-signatures will be created for the contract. Go to your contract and click on “More options” in the lower right corner. Select “Switch to manual signing” and confirm that you wish to switch signing method. Now, you can either send the contract to your counterparts via email or print it and send it manually.